Winds over the past week have battered Britain – reaching astronomical speeds of over 100 mph, and although these speeds only exist in the most extreme cases, seen along Britain’s coast, elsewhere temperatures have dropped severely, seeing a blow of wintery chill running through suburbs and cities alike. With this dramatic turn in the weather you might have felt the effects of the cold blustery winds – perhaps with draughts or cold spots near windows. Often ill insulated, draughty properties – including both older properties and new builds – can lose heat through all kinds of nooks and crannies – meaning vital energy escapes and energy bills soar. Pilkington Spacia™ however, offers a remedy to improve a property’s protection from the outside elements, and whether it’s replacing the frame and glazing unit or simply just replacing the glass in existing frames, Pilkington Spacia™ can help to improve your home’s thermal efficiency – providing a real solution to the problem of balancing historical preservation with modern comfort and environmental requirements. Advances in technology have made windows a significant contributor to the energy efficiency of new as well as old homes. 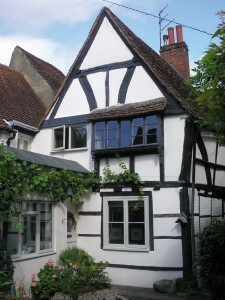 Current restrictions, which are put in place to preserve the character of listed buildings, in some circumstances prevent the improvement of thermal efficiency by not permitting an upgrade from single glazing. Pilkington Spacia™ vacuum glazing, however provides a huge step forward, an innovation in glazing – providing a solution for increasing your home’s energy efficiency, without sacrificing the style and appearance of the window frames. 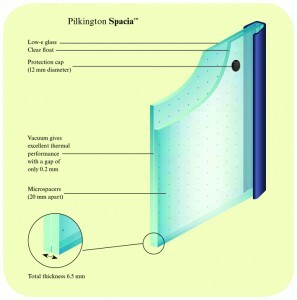 Pilkington Spacia™ vacuum glazing provides a similar level of energy efficiency as modern double glazing, but the unit is typically only a quarter of the thickness of a typical double glazing unit, it can bring a new degree of thermal protection to older buildings whilst retaining the original aesthetics, as well as providing opportunities for thin glazing in new buildings. The glazing solution provides the added benefits of being four times better thermally insulated than single glazing, improving the energy efficiency of your home, reducing carbon emissions as well as your heating bills and it also provides greater internal comfort, as cold spots close to windows are reduced. For more information on Pilkington Spacia™ please click here.